Anyway, I’m going to tell you about the train. Last time I travelled to Moscow (from Piter), I booked a ‘kupe’ ticket, where you get a little cabin which is shared with three others. 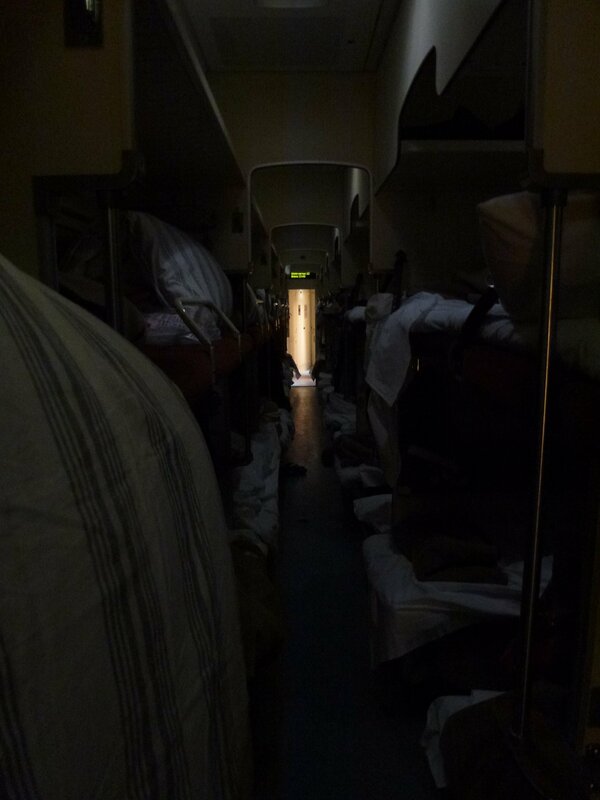 This is fairly standard for overnight trains across Europe at least (though I did catch one from Bucharest in Romania to Athens, and that was seated the whole way. It wasn’t pleasant.). You also occasionally get 2-berths, but that’s very rare. Nowadays, I buy ‘plats-kart’ tickets in Russia, which is where you sleep in a carriage with over 40 other people. Haha it’s not as awful as it sounds, honestly. But right now I’m writing from berth 41—and I’m lucky in that there’s no-one in 42 above me. The carriages are arranged in semi-partitioned sections, with two sets of bunk beds laterally, facing another set of bunk beds arranged longitudinally. It’s pretty chilled, it’s wayyyy cheaper (I paid just over 2000rubles, so around AU$55 or 40-45EUR for the 713.8km journey), and it’s just more festive. Even sleeping, it’s festive. I’m here with people from all walks of life, from all over Russia, and it’s typically very unlikely that anybody speaks English. The kupe cabins seem to be more business people, and then there are the fancy cabins for people with fancy amounts of money. Eugh, my amounts of money are so un-fancy, I’m preoccupied with the fact I accidentally just left a 500ruble deposit at my hostel. That’s like AUD$12! I… need a job. But yes, I also don’t really look like the other people on the train—for one, I look a damn sight healthier, which is concerning. Plus taller. Also, I’m mistaken for German or Scando, not Russian. In fact apparently I stand out enough that the train lady came up to me and asked if I actually wanted to be in a kupe cabin instead. The last two days have been really wonderful. After Saturday night, I awoke at a fairly reasonable time (and, naturally, well after ‘check-out time’) and considered my options. Should I go to St Petersburg that night (where I would spend way less money), or wait until Monday night? Obviously I opted for the latter. I’d been in touch with Artur, who I met last time I was in Moscow. We’d decided to meet at Kolomonskoe metro, and go for a walk in the big park there. Russians are so good at parks! Well, in some respects. In the ‘for’ column is the sheer size and prettiness; in the ‘against’ column is the fact that girls still wear stilettos—for as Artur said, no obstacle is too great for a Russian woman in heels. Paths, cobblestones, mud—they’ll take it all. After an immediate picnic on the grass because I was about to eat somebody, zombie-style, we went walking through the park for 4-5 hours. It was full of apple trees in bloom, a pond that we kept accidentally returning to, ice-cream stands as always, and beds of beautiful tulips. At one end was a tsar’s palace (there seem to be a lot of those), which the sign described as the ‘Eighth Wonder of the World’ (again, there are a lot of those). Actually, the sign was really cool: it was in Russian, English, and Braille, and below the writing was a drawing of the palace which was done in raised ridges, so that blind people could sort of ‘see’ the Wonder. The ‘Eighth Wonder of the World’..? Afterward we went to Шоколадница, Shokoladnitsa, which as the name suggests, is a magical place of chocolatey goodness. We had dinner and ‘real’ hot chocolates, which was actually just melted chocolate in a mug (win! ), and talked for another 3-4 hours. Haha never put language teachers in the same room together, right?! Today I had a nice little sleep-in again, and was again in my own room. How good is that?! Then I decided it might be a good idea to check out Lenin’s tomb. Which turned out to be a bit of a fail, as it’s closed on Monday. But that’s okay, I’m not really that into seeing embalmed dudes anyway. Instead I went for a bit of a walk. 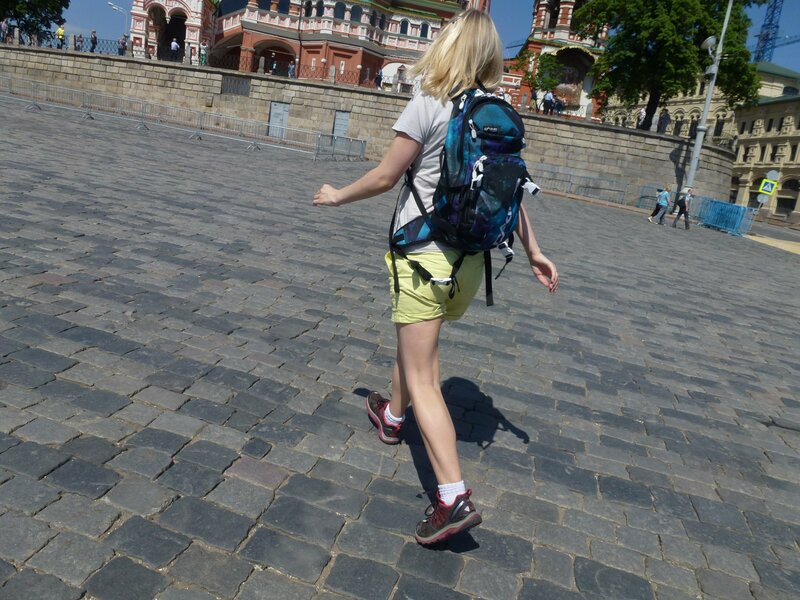 I trailed through Red Square and the Aleksandrovskij Gardens then headed up to Arbat Street. St Basil’s. Because I didn’t take enough photos last time, right?! The honour guard at the memorial to the unknown soldier look like they’re simultaneously falling backward. The current display at the fountain in the Gum/Гум. Arbat was busy at night, but during the day it’s something else. It was full of street performers, cafés with their tables outside in the sunshine, artists displaying their wares, and of course, people everywhere. Entering the street I saw someone wearing a Cheburashka costume, and my goodness, I love Cheburashka. I actually have a little toy sitting on the blind in my room, and several more back in Australia. Not to mention a book. And all of the original series on my laptop. 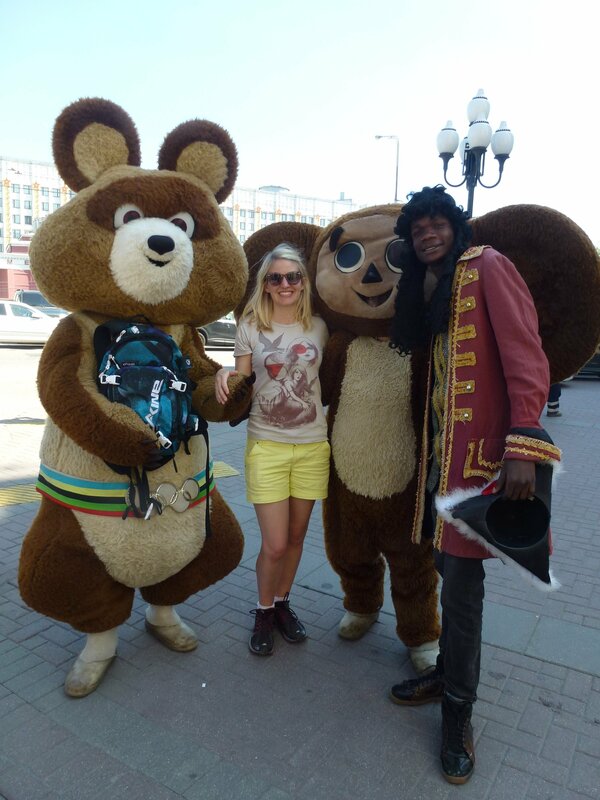 Anyhow, clearly I was getting a photo with life-size Cheburashka no matter what it took. Also there were a pirate (presumably Cap’n Jack? ), and the two mascots from the Winter Olympics. I didn’t care about them at all, but who am I to exclude anyone? So I ended up having the pirate hat popped on my head (after the pirate’s surprise at my huge noggin), sandwiched between Cheburashka and whatever-they’re-called. Then photo time! Afterward they said “5”. To which my response was “five hundred?” The pirate, being true to form, said yes. I told him I’d give him two. Which I did. Then he asked nicely so I gave him another hundred. Haha he was having a laugh. Next I walked across to Tverskaya Street, which is a super-fancy street, and probably the most well-known in Moscow. It is money, and it leads straight to Red Square. I wanted to return to a bookstore I’d checked out on Saturday—specifically, the politics section. There are some ‘interesting’ titles on Ukraine. I particularly enjoyed the chapter headings about the USA being full of Nazis, and “Germany’s plans” for Ukraine. Needless to say, I bought one of the more dramatic titles for posterity. I was actually only going just around the corner from my hostel, where Jack (from Friday) was running the ‘Moscow Pub Quiz’. He runs it every two weeks, with different people hosting, and apparently it’s become quite a thing. After a few awkward minutes post-arrival, Jack told me to sit down at the bar (I was clearly looking at least as awkward as I felt), where the girl next to me said hello. She recognised me from Friday night, and invited me onto their trivia team. Then another of the girls from Friday came over for a chat as well. Haha I felt like I knew people! I won’t know the result of the trivia until I next have internet (in St Petersburg), as I had to leave before all of the answers had been given and checked. So I’m going to try and get some sleep now, and will be very intensely thinking “go team Black Flamingo” in my dreams. And because I can’t help myself, further side-note: I learned tonight that apparently flamingos are white, and they only turn pink because of all the crab they eat. What?! Mind, blown. PS, I realise I haven’t posted about Saturday yet, but will do and back-date within the next day or so.